Twenty years on from his rugby retirement, former Scotland captain Rob Wainwright completed a fresh Calcutta Cup challenge in aid of his teammate Doddie Weir’s MND charity. Rob and record-breaking cyclist Mark Beaumont cycled 500 miles between Murrayfield and Twickenham in 48 hours. Departing from Murrayfield on Thursday 14th March, they met the Scotland rugby team at Edinburgh Airport to be given a Calcutta Cup match ball before the team flew south. Rob and Mark then cycled to Twickenham to return the ball to the team as they arrived for the final match of the Calcutta Cup. Members of the public got involved, joining them on sections of the route and donating a pound for each mile they cover. There was also an opportunity to join them virtually. 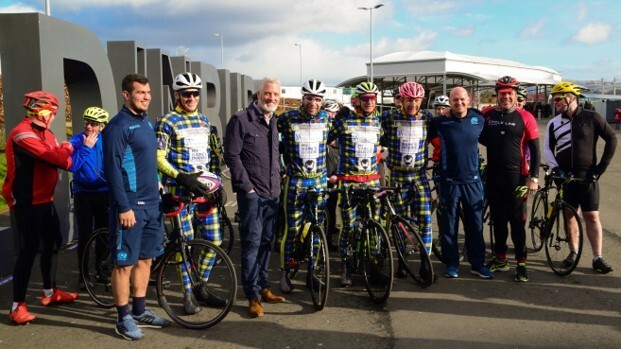 “Mark and I wanted to support Doddie’s charitable efforts and realised there was a great opportunity to bring our two sports together in this epic challenge. “In attempting to ride 500 winter miles in 48 hours and keep up with a record-breaking cyclist a few decades my junior, I challenged my body while I still can. I am inspired by the spirit of an old friend for whom such challenges may now be in the past, but who fights MND with a fortitude I can only aspire to. For more information visit www.doddie500.com.